Mountain biking can generally be broken down into multiple categories: cross country (XC), trail riding, all mountain, downhill, freeride, slopestyle, dirt jumping and trials. The vast majority of mountain biking falls into the recreational XC, and Trail Riding categories. This individual sport requires endurance, core strength and balance, bike handling skills, and self-reliance. Advanced riders pursue steep technical descents and, in the case of freeriding, downhilling, and dirt jumping, aerial maneuvers off both natural features and specially constructed jumps and ramps. Mountain biking can be performed almost anywhere from a back yard to a gravel road, but the majority of mountain bikers ride off-road trails, whether country back roads, fire roads, or singletrack (narrow trails that wind through forests, mountains, deserts, or fields). There are aspects of mountain biking that are more similar to trail running than regular bicycling. Because riders are often far from civilization, there is a strong ethic of self-reliance in the sport. Riders learn to repair their broken bikes or flat tires to avoid being stranded miles from help. If want to know more about Mountain Biking click here to go to the British Cycling website. Many riders will carry a backpack, including a water bladder, containing all the essential tools and equipment for trail-side repairs, and many riders also carry emergency supplies in the case of injury miles from outside help. 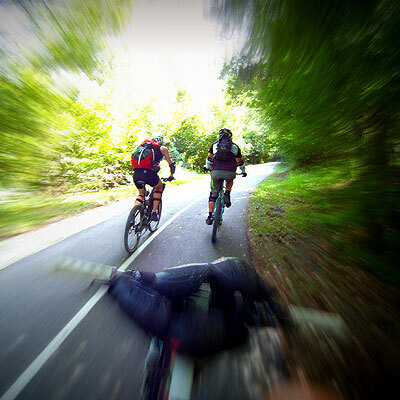 Club rides and other forms of group rides are common, especially on longer treks.